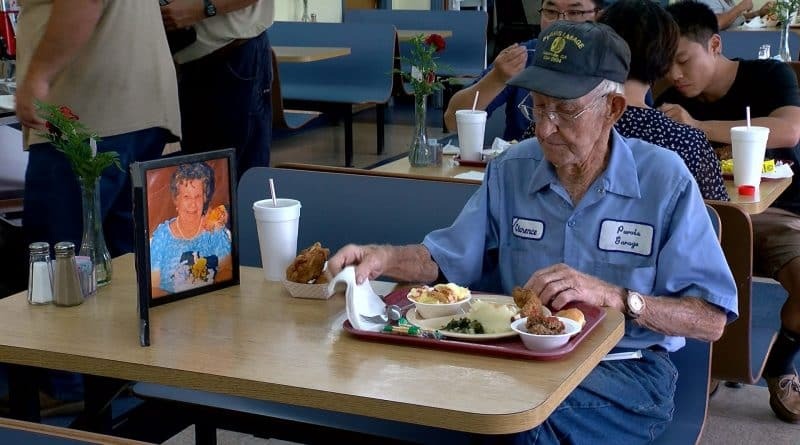 93-year-old pensioner Clarence Purvis proved that true love exists. He lived with his wife 63 years, and even 4 years after her death, the feelings of men remained the same. The people of the state of Georgia Clarence and Carolyn Purvis fell in love with each other in 1948 when he was 24 and she was 16 years old. The couple married a year later, when she graduated from high school. Their long marriage lasted 63 years. Over the last 13 years they dined at the same restaurant Smith’s in Reidsville. This habit has remained with Clarence, even after the death of Carolyn four years ago. «She was always with me when we lived together. And now she is with me,» he told WTOC, pointing to pictures of the wife that stands beside him. Every day he sits at the same table in the restaurant and orders a dish from the daily special menu. The restaurant’s owner , Joyce James said that the man became part of their institution. She believes that his devotion touched the hearts of many visitors. Clarence told me that sometimes he just find another woman. According to him, some people think that the way he just can’t accept the loneliness. «No one liked each other more than I and my wife – told Clarence. I wanted what she wanted, and she wanted what I wanted». Clarence thinks about his deceased wife and visits her grave about 125 times in a month. Despite his advanced age, the man supports the wife’s grave is in immaculate condition. «I love her very much and miss you, – he said. – I think that she’s with me».